Everyone who knows me knows that I love a deal. 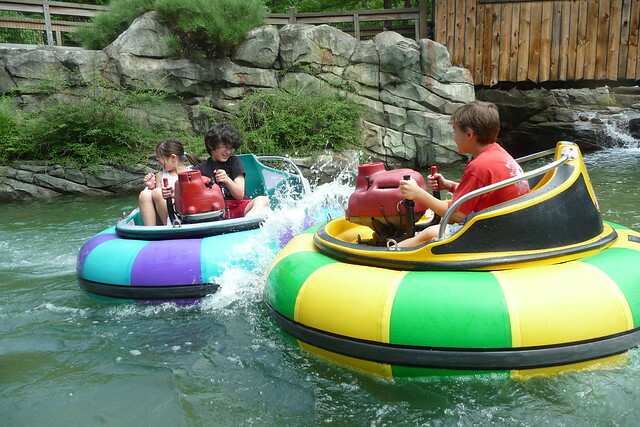 So after I signed up for Groupon earlier this year, I couldn't pass up all the great family activities they offered. Some were from places that we've gone before, some were things that we've always wanted to try and some were places that we go every year regardless. Having a fistful of Groupons led to an extremely tightly scheduled summer with no lazy days to take a spontaneous trip to the beach. In fact our only beach day planned got rained out by hurricane Irene. We finally made it to the beach over Labor Day weekend, AFTER school started. 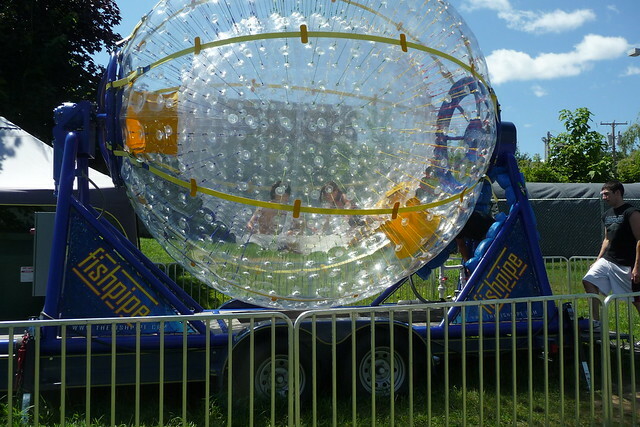 So here's how the Groupon summer of 2011 went. 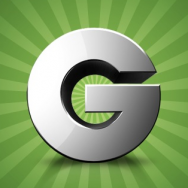 As you may know, Groupons are only available for purchase for a few days, so these links are now expired. We managed to use them all before the Groupons themselves expired thanks to my OCD scheduling. I purchased four $15 passes for Mel's Funway Park which gave us each a go-kart ride, batting-cage tokens, a round of mini-golf, a small bucket of balls for the driving range, a laser-tag game, and a laser-maze game. Whew! 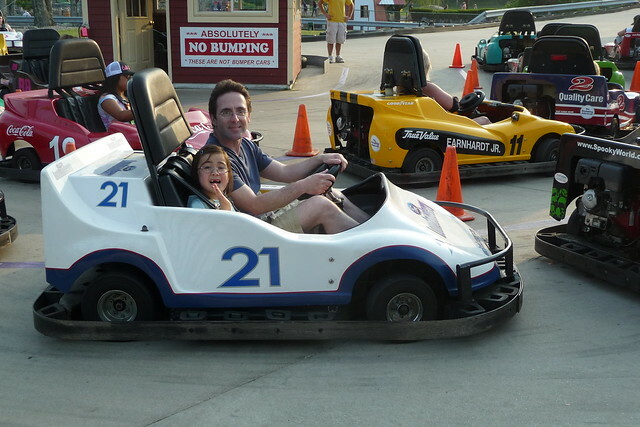 It was a fun-filled family outing for an incredible price. 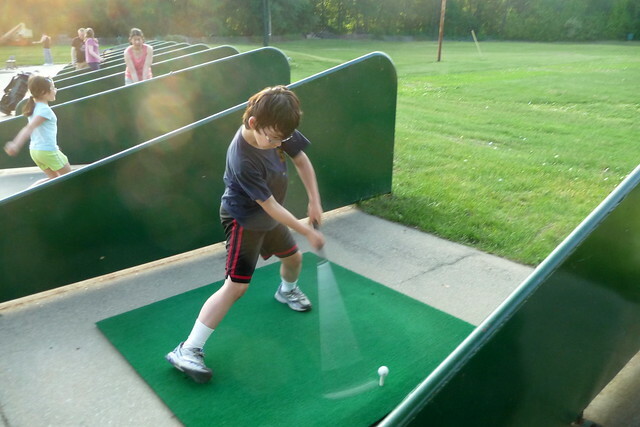 Adam swings for golf like a baseball (nice shot taken by Doug). How cute is Dova in the batting cage! Mel's Funway Park (now without the Mel in the name, but all the local's still use it) is good, wholesome fun. We are definitely going back. Again I purchased four $15 passes which we used for bumper boats, mini golf, driving range, batting cage, the arcade and ice cream. I took the kids with one of Adam's friends. 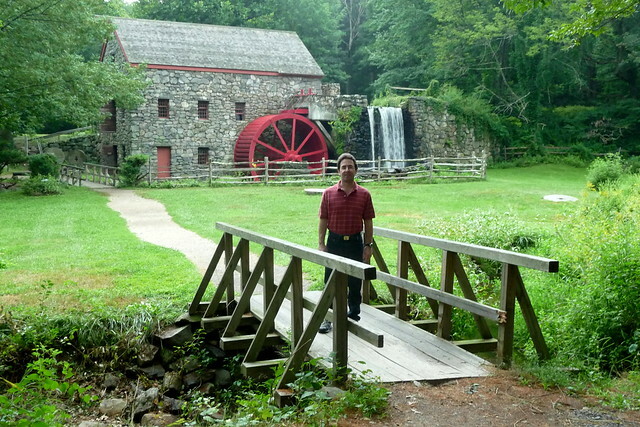 We've been to Kimball Farm many times for gathering with friends and even a company outing. 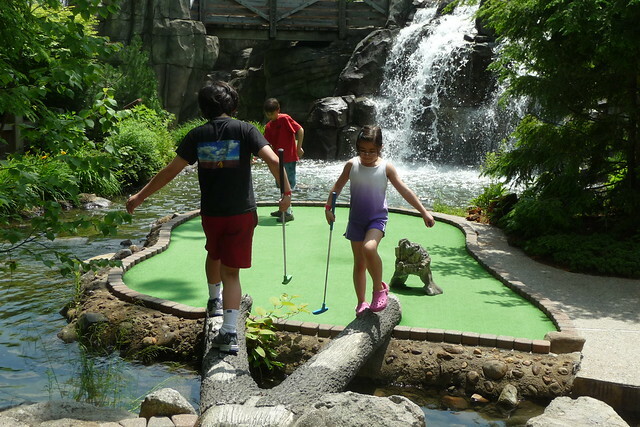 Kimball's has one of the most beautiful mini golf courses I've ever seen (I would never tell my kids to walk the logs just for a photo op ). 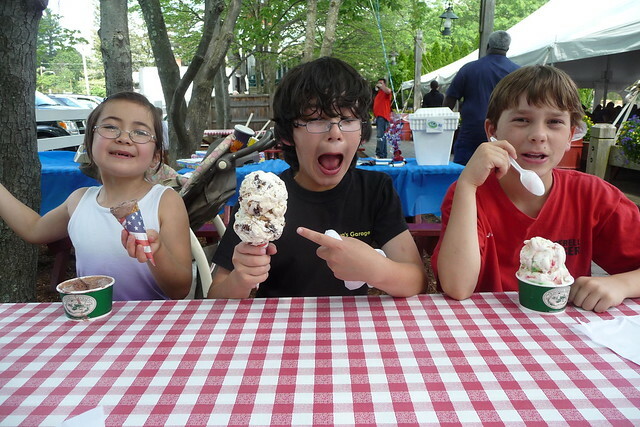 But long before Kimball Farm had all those attractions, they were most famous for their ice cream. Those are the small size. Nom!! Chunky's is a movie theater with tables flanked by individually reclining Lincoln Town Car seats. You can order anything from appetizers to a full meal, including beer and alcohol (my favorite is the Captain Morgan root beer float - an alcoholic meal in itself). 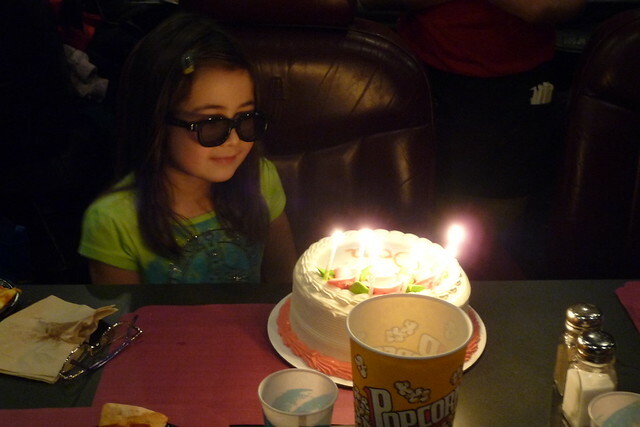 This photo was taken at Dova's 7th birthday party last year (they do parties too), complete with 3D glasses. 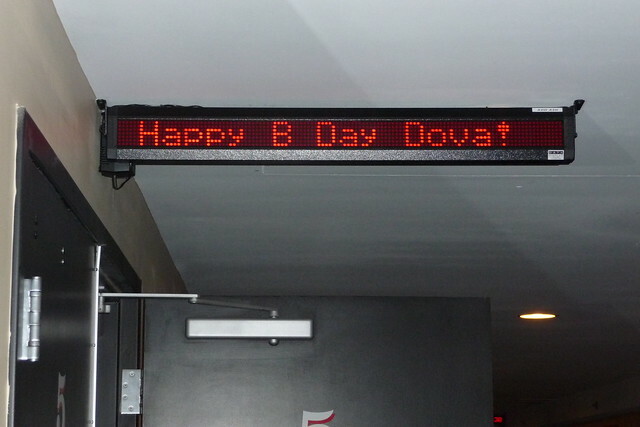 How cool is it to see your name on the movie marquis!! Since we go to Chunky's Cinema Pub all the time, it was a no brainer to spend $10 for a Groupon that covered movie admission, popcorn and a $10 worth of food. We ended up going with my mom over the summer to a movie I can't remember because of that Captain Morgan root beer float. Arrrrr! 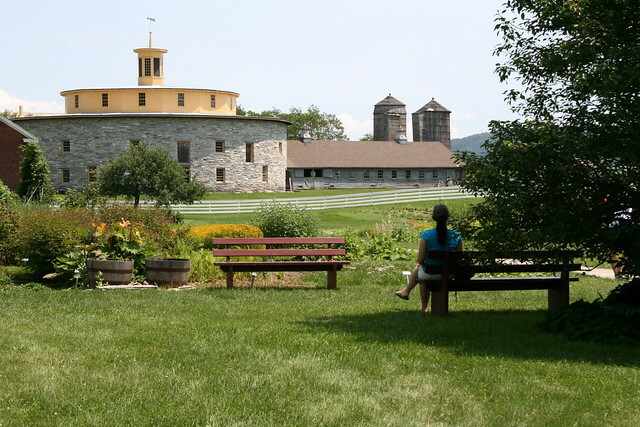 Hancock Shaker Village in Hancock, MA. 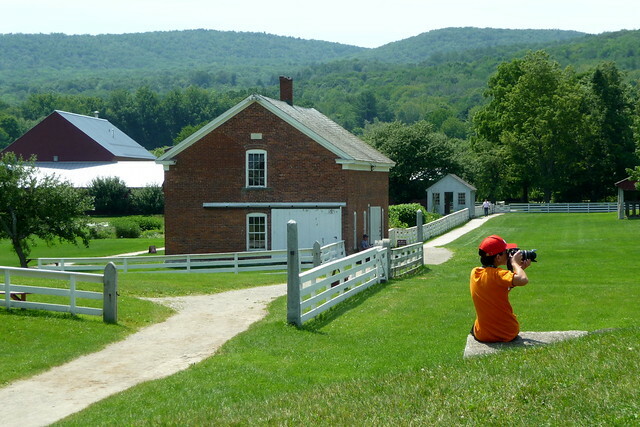 Every year, we vacation in the Berkshires and we always visit the Hancock Shaker Village. This time we went with a discount thanks to Groupon. Yes, Adam used the DSLR and I used the point and shoot camera. Thankfully, you can't take a bad photo in this picturesque piece of paradise. 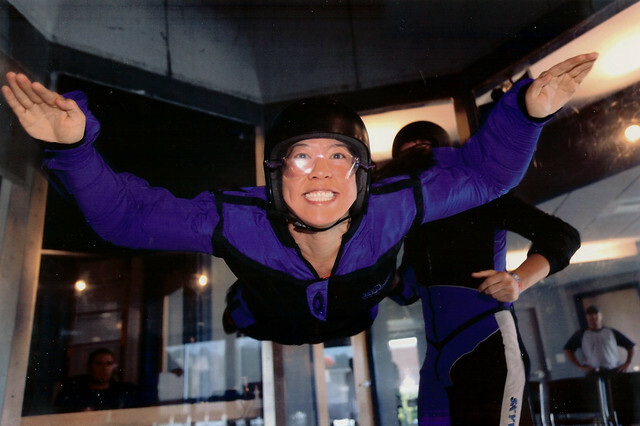 Indoor skydiving is not something I would normally plunk $95 just to try. But with the Groupon at nearly half price, we decided to go for it. What a blast it was! The kids chickened out, so Doug ended up taking the second Groupon I purchased. I simply could not wipe that goofy grin off my face, partially due to the wind and partly due to the fact that I was giggling the whole time. 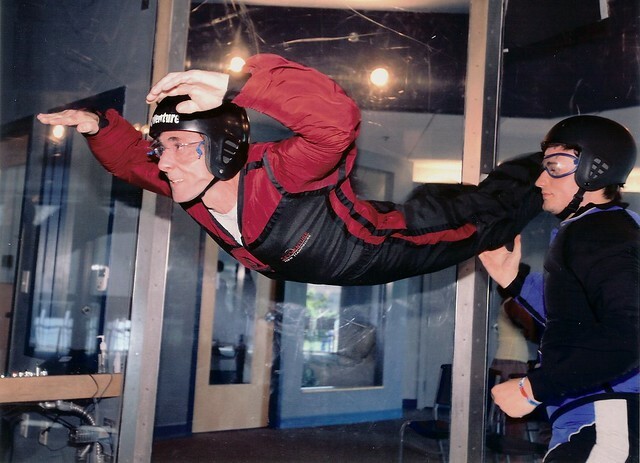 Doug was a total natural in the indoor skydiving wind tunnel. He is even considering real skydiving now! Somehow I knew the kids weren't about to fly for the indoor skydiving, so I purchased Groupons for the newly opened Fishpipe at SkyVenture. They had 90 seconds of water spinning fun, although I wouldn't say that it was necessarily worth even the discounted price. I expected total craziness in there, but they were fairly calm and still had a ton of fun. The Wayside Carriage House Inn is new ancillary inn for the original Wayside Inn, which only has 9 rooms and a year-long waiting list. Doug and I enjoyed dinner and a night away from the kids with another couple who also purchased a Groupon. Imagine spending an evening only with adults! 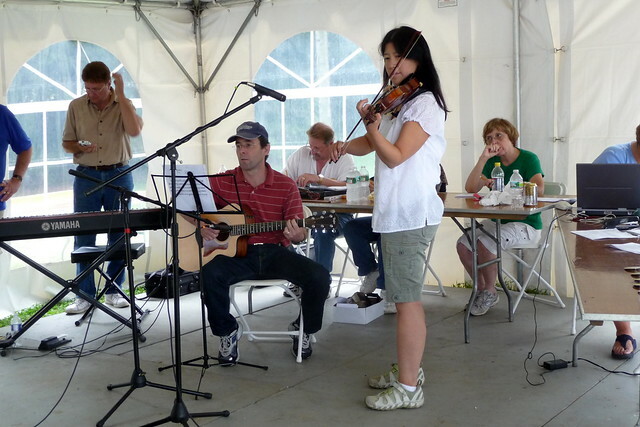 The day after staying at the Wayside Carriage House Inn, Doug and I participated in my first fiddle contest at the Bolton Fair. Fiddling entrants still have to pay to attend the fair, so we got in for half price using the Groupon. Yeehaw! If you'd like to get in on the Groupon action, please use this referral link to sign up for an account (I get $10 for opening the world of Groupon to you). I also belong to several other savings sites, the locally-based Eversave (another referral link), and LivingSocial (not a referral, boo hoo), but Groupon has by far garnered the most deals that match my family's interest. One word of caution for new savers, you will get emails every day from these companies. If you're like me and hate to be inundated with emails, but don't want to miss out on the deals, you can subscribe to the feed for your local city through a reader like Google Reader. The local RSS feeds are easy to find on Groupon, but not so much so for the other sites (I recommend using a Firefox's automatic feed detection or Chrome's RSS Subscription Extension). Happy Grouponing! Wow--what a fantastic summer of deals! Looks like you all had a great time.